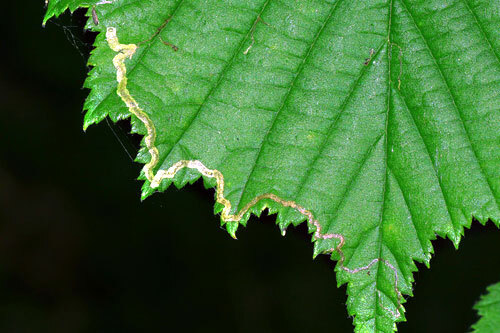 Oviposition at the underside of the leaf, in a vein axil. Mine a slender, gradually widening corridor; the last section is clearly wider than the larva. In the first section the vaguely delimited frass line almost fills the corridor. Later the frass lies in irregular arcs and clouds, filling about one third of the width of the corridor. 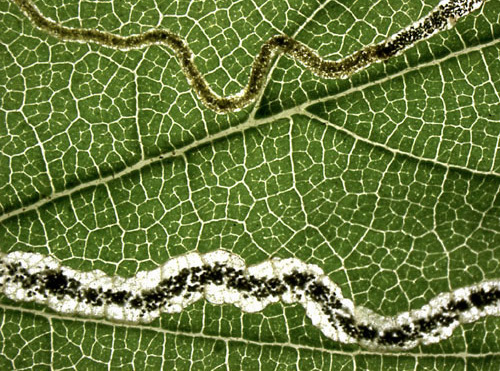 The trajectory of the mine is not angular, independent of the leaf venation. Pupation external, exit slit in the upper epidermis. Carpinus betulus; Corylus avellana, maxima. 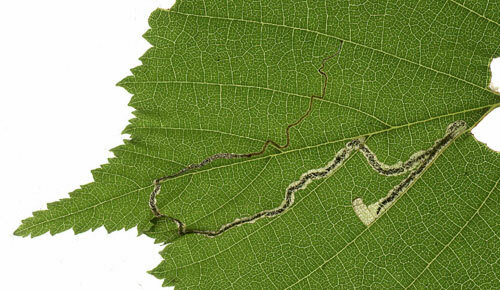 Only rarely on Carpinus (Johansson ea, 1990a). Found xenophagously onBetula (Emmet, 1974a). 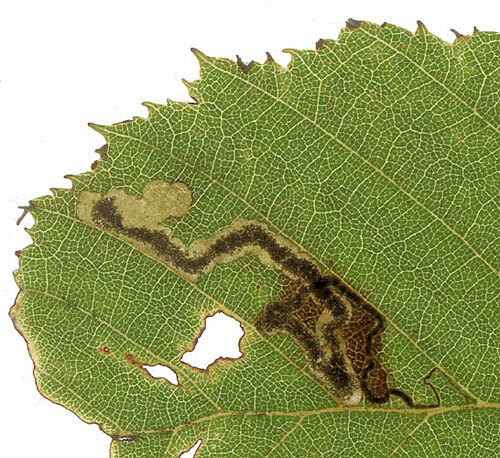 Larvae (in the UK) in June – July, and September – October (Emmet, 1983a). All Europe, except the Balkan Peninsula and the Mediterranean Islands (Fauna Europaea, 2009). Pale greenish to pale yellowish; see zie Gustafsson & van Nieukerken (1990a) for a description. Contrary to St. microtheriella, the metanotum has a broad zone of fine spinules. Nepticula floslactella; Nepticula saxatilella Grönlien, 1932 (cf Nieukerken & Johansson, 1987a). Ahr (1966a), Anisimovas, Diškus & Stonis (2006a), Beiger (1979a), Bengtsson (2008a), Borkowski (1969a), Buhr (1935a, 1964a), Buszko & Baraniak (1989a), Buszko & Beshkov (2004a), Diškus & Stonis (2012a), Emmet (1974a, 1983a), Gustafsson (1985a), Gustafsson & van Nieukerken (1990a), Haase (1942a), Hartig (1939a), Hering (1934b, 1957a), Huber (1969a), Johansson ao (1990a), Kasy (1983a, 1987a), Klimesch (1936a, 1950c), Klimesch & Skala (1936c), Kuchlein & Donner (1993a), Kuchlein & de Vos (1999a), ME & MA Kurz (2007a), A & Z Laštuvka (1997a, 2014a), Maček (1999a), Matošević, Pernek, Dubravac & Barić (2009a), Michalska (1972a, 1976a), Michna (1975a), Navickaitė, Diškus & Stonis (2014), van Nieukerken (1986a, 2006a), van Nieukerken & Johansson (1987a), van Nieukerken, A & Z Laštuvka (2004a, 2006a), van Nieukerken, Zolotuhin & Mistchenko (2004a), Nowakowski (1954a), Popescu-Gorj & Drăghia (1966a), De Prins (1998a, 2007a), Robbins (1991a), Schütze (1931a), Sefrová (2005a), Skala (1939a, 1941a, 1951a), Sønderup (1949a) Stammer (2016a), Steuer (1995a), Stonis, Navickaitė, Rocienė ao (2013a), Surányi (1942a), Szőcs (1977a, 1978a, 1981a), Ureche (2010a), Zaberga, Legzdina, Otfinowski & Obelevičius (2014a).